Do you have a flag at your house, your school, your office, or on your car? In the US, many people display US flags, but you also see lots of other kinds of flags—flags from people’s countries of family origin, or rainbow flags for LGBT pride, or even confederate flags recalling the Civil War era. Whether or not you like a particular country’s flag, or agree with what a given flag stands for, you have to admit that people don’t often run into trouble for flying their various flags. They certainly don’t end up in jail. But then again, they don’t live in Indonesia. On December 1, 2004, Filep Karma was arrested for raising a flag during a peaceful ceremony in Papua, Indonesia. Sentenced to 15 years behind bars for his nonviolent activism, Filep continues to be an Amnesty International prisoner of conscience, and he needs our help! Now is the time to take action: flood the streets of DC, educate your community, Write for Rights, stand with Filep now! Today, Amnesty International activists and supporters rallied in front of the Indonesian embassy in Washington DC to raise their voices on behalf of prisoner of conscience Filep Karma, an activist who’s spent the last 7 years in prison for raising a flag. The rally was held a week after Secretary of State Hillary Clinton traveled to Indonesia for the Association of Southeast Asian Nations (ASEAN) Regional Entrepreneurship Summit. Amnesty International urged Clinton to publicly state that human rights will play as important a role as trade and security in US–ASEAN relations. Even at nine in the morning on a Friday, when most of us would normally be counting down to the weekend, the energy in the Foundry in Washington, DC is phenomenal. In the sunshine outside, groups color flags in support of Filep Karma, while inside roses and key actions are passed around for signatures. Larry Cox hasn’t even arrived yet, and everyone is already buzzing with excitement. By the time everyone has settled inside for the opening speeches, the count is well over one hundred Amnesty International activists. The various speakers infect the crowd with even more passion and anticipation, reaching a pinnacle when Larry announces that he has decided that joining us for Get on the Bus is more important than going home to meet with the IRS. The group splits, half heading to demonstrate for the Women of Zimbabwe (WoZA) at the Zimbabwe Embassy and half for Walid Yunis Ahmad at the Iraqi Consulate. We march in long ovals, chanting and holding our signs, the very picture of peaceful protest. At the Iraqi Consulate, faces peer out from the windows and passers by stop to watch. The global Write for Rights write-a-thon may have ended last week, but Filep Karma still needs your help more than ever. While thousands of people were writing on behalf of Filep, who’s imprisoned in Indonesia for raising a flag, he was arbitrarily transferred from Abepura prison where he was held to a police lock-out in neighboring Jayapura. His transfer, along with political prisoner Buchtar Tabuni and others, followed a prison riot triggered by the killing of an escaped convict by prison authorities on December 3rd. Filep Karma and Buchtar Tabuni (along with another prisoner) were interrogated by police officials as witnesses to the riot. News reports claim that the police have not charged the men with any criminal offenses. Since their relocation to police headquarters in Jayapura, Filep Karma, Buchtar Tabuni and other prisoners have reportedly suffered degrading treatment, including denial of access to food and drinking water, medicine, family and legal counsel. Karma, whose health has been fragile since major surgery in July, protested these detention conditions with a several-day hunger strike. Amnesty International is concerned that Filep Karma may be denied access to adequate medical attention. The men should be granted immediate access to legal counsel of their own choosing, and any medical attention they may require. The Write-a-thon may be over but there is no time for respite. Join us in taking action for Filep Karma now. First and foremost, President Obama must demand the immediate release of political prisoners. Some individuals such as Filep Karma have been imprisoned for peacefully protesting by merely waving the Papuan flag. He should do this before arriving in Indonesia to demonstrate our commitment to the right to protest peacefully and the freedom of expression. Just last year in September, Indonesia passed a law that endorses stoning as a punishment for adultery. Not only is adultery punished but so is sexual orientation if it is not heterosexual, which can receive a punishment of 100 lashes from a cane. President Obama must urge the Indonesian authorities to repeal these laws which use cruel and unusual punishments. Lastly, freedom of religion is severely restricted. In fact, several laws further restrict freedom of thought and conscience. “Blasphemy” is punishable by up to 5 years of imprisonment and at least 13 people are currently serving time under this law. Christian groups have been attacked by villagers linked to the Islamic Defenders Front, who enjoy impunity for their crimes. Obama should demand that the Indonesian authorities guarantee freedom of religion and protect religious minorities. The United States needs to stand with human rights in Indonesia and advocate for the protection of peaceful protestors, the repeal of inhumane punishments, and the guarantee of freedom of religion. The best time to do that is when President Obama touches down on Indonesian soil on November 9th. Indonesian prisoner of conscience Yusak Pakage has been released from prison! Along with fellow political prisoner Chosmos Yual, Pakage was released this morning from the Doyo Baru prison. Pakage was sentenced to a 10 year jail term for raising the Morning Star flag in December 2004. 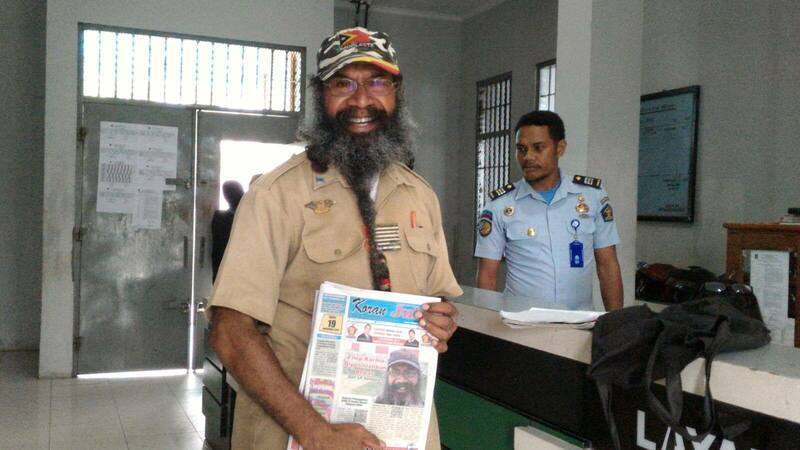 He, along with Filep Karma, was found guilty of “rebellion” for flying the outlawed symbol of Papuan independence as a sign of peaceful protest of Indonesian government policy. Pakage has expressed his thanks to Amnesty International and Human Rights Watch for all the work put towards demanding his release. Amnesty supporters took action by petitioning the Indonesian government, holding vigils, and standing in solidarity on his behalf. While we welcome this great news, fellow prisoner of conscience Filep Karma still remains in prison. We must continue to take action in demanding Karma’s release. Call on your Members of Congress to support House Resolution 1355 calling for the release of Indonesian political prisoners. Additionally, you can stand in solidarity by contributing messages of hope and support and writing directly to the president of Indonesia. Pakage’s release is a huge success, but we need your continued support to demand that Indonesia uphold international laws of free and peaceful expression!